In Queen of Earth, writer-director Alex Ross Perry—who does snippy black comedy better than just about anyone else on the current American indie landscape—dials down the humor that has defined his work to this point, and turns up the queasy psychological currents that have always gurgled underneath it. Walking a fine line between pastiche (think early Roman Polanski and Persona-era Ingmar Bergman crossed with the opening scenes of a backwoods grindhouse flick) and bona fide psychodrama, Queen Of Earth works much of the same subject matter—egoism, self-destruction, mutual loathing—as Perry’s earlier films; in fact, it’s not hard to think of it as a companion piece to last year’s superb Listen Up Philip, and not just because the two movies appear to share a fictional universe. And yet, there is an innate, affecting strangeness to Queen Of Earth, which is pitched somewhere halfway between actor’s showcase and creepy formal exercise, continually foreshadowing a burst of psychotic violence that never comes. Shot quickly and on a modest budget in the weeks before Listen Up Philip hit theaters, the movie reunites Perry with Elisabeth Moss, who played one of the three central characters in the earlier film. Here, Moss plays Catherine, a New Yorker disintegrating—perhaps more rapidly than anyone cares to notice—following the death of her father, a famous artist who always overshadowed her, personally and creatively. Most of Queen Of Earth is staged around a secluded lake house a few hours drive out of the city, where Catherine is brought by longtime pal Ginny (Katherine Waterston) to spend some quiet time hiking, painting, and reading books by Ike Zimmerman, the novelist played by Jonathan Pryce in Listen Up Philip. Mixed tones have always been Perry’s thing, and here he stakes much of the movie on the contrast between two remarkable, radically different performances, with Waterston intensely underplaying her role while Moss turns feral, channeling a heretofore unseen energy that eventually suggests possession. Far from a study in mental illness, this is the madness-as-metaphor of classic fiction and theater, and Perry—who has always worn his bookish influences on his sleeve—seems to be consciously working within the long literary tradition of madwomen. Like all of Perry’s prior features, Queen Of Earth was shot on 16mm, though here he and his longtime cinematographer, Sean Price Williams, go for a slightly different, trickier formal palette. Both the director’s little-seen debut, Impolex, and his breakthrough feature, The Color Wheel, climaxed with talky, nearly-10-minute long takes that stuck the audience straight into the characters’ emotional trauma; here, he pulls one together early on, structured as a series of eerily intimate close-ups in which the slowly panning camera draws the viewer into Catherine and Ginny’s characters while establishing the connection (or lack thereof) between them. Brian De Palma-style split diopter shots—in which both foreground and background are in focus, separated by a fuzzy middle—recur, making for an effective visual metaphor for the central relationship. Meanwhile, Keegan DeWitt’s dissonant score—which can’t help but bring to mind the arthouse films of the 1960s and ’70s—goes a long way to establishing and maintaining mood, much as the composer’s cool-jazz-style music did for Listen Up Philip. That mood is goosebump-inducing unease, often unnervingly in tune with Moss’ performance, which is all the more fascinating because it’s essentially unreadable, positioning Catherine as a figure of both sympathy and threat. 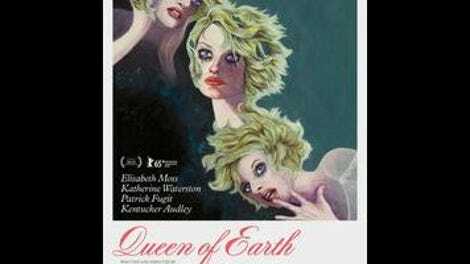 Though one would be hard pressed to classify Queen Of Earth as a comedy, it isn’t without a sense of humor, and the fact that Catherine’s unraveling happens to be darkly funny helps to further complicate a film already complicated by contrasting styles, deliberate intersections of the archetypal and the closely observed and meshings of pet theme (another country house, another narcissistic father, etc.) and reference. Not all of Queen Of Earth gels perfectly—the movie’s variation on the ghoulish party-from-hell, a Perry staple, is a rare bum note, working more as homage than anything else—but when it does, it can be breathtaking.